Poo-pourri Traps Embarrassing Bathroom Odors- No Sh*t! Well here’s a health product I never expected to be reporting on, but here I am about to drop a load of information on you. Poo-pourri is one of those products born out of necessity (as most great retail offerings are). As you may have gathered from the name, Poo-pourri is a spray meant to neutralize the offensive odors that arise when you go #2. Unlike traditional room spray though, Poo-pourri is not an afterthought meant to cover-up an already present stench. 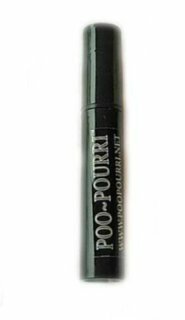 Poo-pourri stops foul emissions before they have a chance to permeate their surroundings. Talk about a new idea that’ll really make waves! One simply spritzes the bowl with their handy Poo-pourri before making a deposit. The all natural odor eliminators create a barrier in the basin that prevents emanations from drifting back up once business has been taken care of. Even ‘floaters’ don’t stand a chance against the power of Poo-pourri. The offenders are coated with the product when they first penetrate the surface of the water and are, therefore, rendered powerless. And what do you do when you’re away from your home throne and you have to go? Poo-pourri has you covered there too. After all, making a stink at home is one thing, but when you’re out it’s a whole different matter. Poo-pourri comes in convenient purse/pocket friendly sizes. There are brilliantly named fragrances to suit every taste too including, Deja Poo, Heavy Doody, No. 2 and Royal Flush. Anyways, thanks for shooting the sh*t with me. If you want to see what others are saying about Poo-pourri or order some up click here. Inflatable Speed Boat for Kids: Make Some Waves!